crypto-trader.cc is a long term high yield private loan program, backed up by Forex market trading and investing in various funds and activities. Profits from these investments are used to enhance our program and increase its stability for the long term. The amount of 3 USD has been deposited to your account. Accounts: U19363969->U2631114. Memo: API Payment. Withdraw to MYINVESTBLOGER from crypto-trader.cc.. Date: 06:13 14.03.19. Batch: 250710883. The amount of 0.75 USD has been deposited to your account. Accounts: U19363969->U2631114. Memo: API Payment. Withdraw to MYINVESTBLOGER from crypto-trader.cc.. Date: 06:35 15.03.19. Batch: 250888551. The amount of 0.6 USD has been deposited to your account. Accounts: U19363969->U2631114. Memo: API Payment. Withdraw to MYINVESTBLOGER from crypto-trader.cc.. Date: 06:10 17.03.19. Batch: 251211569. The amount of 1.5 USD has been deposited to your account. Accounts: U19363969->U2631114. Memo: API Payment. Withdraw to MYINVESTBLOGER from crypto-trader.cc.. Date: 06:01 19.03.19. Batch: 251559441. The amount of 6 USD has been deposited to your account. Accounts: U19363969->U2631114. Memo: API Payment. Withdraw to MYINVESTBLOGER from crypto-trader.cc.. Date: 05:15 21.03.19. Batch: 251901032. The amount of 3 USD has been deposited to your account. Accounts: U19363969->U2631114. Memo: API Payment. 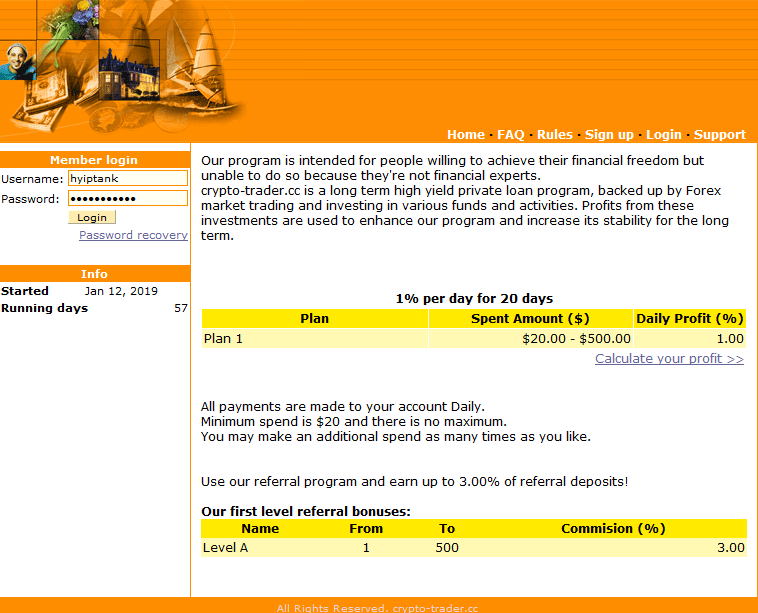 Withdraw to MYINVESTBLOGER from crypto-trader.cc.. Date: 05:24 25.03.19. Batch: 252489940. The amount of 1.5 USD has been deposited to your account. Accounts: U19363969->U2631114. Memo: API Payment. Withdraw to MYINVESTBLOGER from crypto-trader.cc.. Date: 05:24 25.03.19. Batch: 252489942. The amount of 0.6 USD has been deposited to your account. Accounts: U19363969->U2631114. Memo: API Payment. Withdraw to MYINVESTBLOGER from crypto-trader.cc.. Date: 05:24 25.03.19. Batch: 252489952. The amount of 1.5 USD has been deposited to your account. Accounts: U19363969->U2631114. Memo: API Payment. Withdraw to MYINVESTBLOGER from crypto-trader.cc.. Date: 05:24 25.03.19. Batch: 252489958. 03.26.19 15:19	Account	Transfer	-100.00	Sent Payment: 100.00 USD to account U19009482 from U1............... Batch: 252722001. Memo: Shopping Cart Payment. Deposit to crypto-trader.cc User vertex.